This entry was posted on June 22, 2016 by Michael Colon. If you are a Jehovah’s Witness , this all-in-one tract holder is specifically designed for you. It has the right combination for easy handling, finding and displaying your tracts in a neat and organized manner. 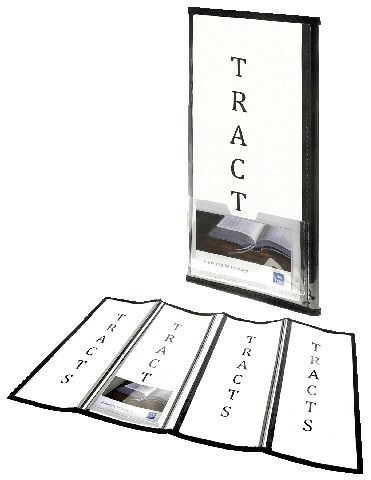 These tract holders are the most cost-effective and convenient way to protect your tracts from getting torn, bent or ripped when kept along with your other belongings. This tract holder is built with high-quality materials to help you keep your tracts safe from rain or other harsh elements. All of your literature can be kept in one easy location and in a much cleaner and orderly fashion. The construction material used to build these tract holders is easy to wipe and clean, easy to maintain, and gives long-lasting life to the pages of your book. These wonderful tract holders are affordable and they will definitely make excellent gift material for your friends and loved ones. You can pair these tract holders with scripture based greeting cards for any special occasion, and can order one for yourself as well. Have your days get off to a good start with this option to keep your tracts and carry them with you wherever you go without worrying about damaging them.